Modbus OPC server,Modbus software,Modbus server,Modbus RTU,Modbus TCP,Modbus ASCII,OPC via Modbusupported Modbus RTU, TCP, ASCII protocol specifications. 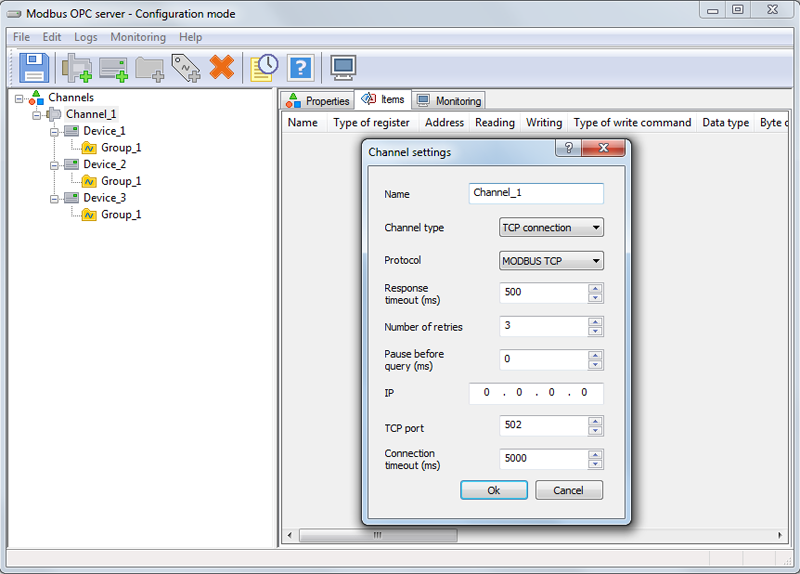 Features: Modbus devices autosearch, tags emulation mode, tags poll without OPC client. The OPC server provides the OPC clients (any advanced SCADA systems) with an access to devices, supporting the MODBUS protocol. To have a trial run of the software product, you can use, absolutely free of charge, 30 tags without any time limit. To handle more than 30 tags, you can use a 30-day fully functional trial period. Automatic search for connected devices reduces the configuring time. Configuration import/export into the CSV format significantly accelerates the configuring process. Polling tag values of the device at varying intervals increases the speed of reading of critical parameters. Surveying and viewing tag values without the OPC client connection allows the OPC server to be initially set without application of any additional software. Tag value emulation provides the opportunity to debug projects in the upper level systems without any physical access to metering instruments. Run as a Windows Service feature allows you to get rid of possible problems to run multiple instances. Removing from the survey function allows to keep the system speed, even in case of failure of devices on the bus. Ability to work on a broadcast address saves sending commands time.